Three decades ago, I stumbled into a three year period in my working life where I had time to pursue all the extra-cirricular activities I desired. Through a spectacular right place/right time moment, I landed a part time teaching job. We lived in a small but cozy and affordable house in Chico, California where we could walk to the market and downtown. We got by with one car, a Beetle that I maintained with the help of the Idiot’s Volkswagen book. We grew veggies, and somewhere along the line, I started making bread, not just to save a few pennies, but because I found it satisfying and delicious. That was one of several things that went by the wayside when I joined the high-tech workforce – until two days ago. In a recent post I wrote of attending a retreat with Edward Brown, a long-time Zen student, teacher, chef, and the author of The Tassajara Cookbook and The Tassajara Bread Book. I purchased both books. This was not an impulse buy – I attended a workshop with Edward a year ago and almost bought the books then, but worried that I didn’t have enough time. This year I decided to make time, with the results you can see above. The loaves taste as good as they look. I’d show you the Orange Whole Wheat Pancakes, but unlike the bread, they did not have to cool before eating, so they didn’t last long enough for snapshots. The directions in the Breadbook are clear and lively. Brown takes the time to explain why you do things this way and not that, a feature lacking in many cookbooks. There is something elementally satisfying in baking one’s “daily bread,” and I cannot think of a better book on how to do it. This entry was posted in Book Reviews and tagged authors, book reviews, Cooking, postaweek2011. Bookmark the permalink. Ah, Morgan, you do know how to do retirement! I bought this book years (ok, decades) ago and never opened it. Now that I am breadmaking (gardening, etc) again, I’ll have to see if I can find it. Thanks for the reminder! 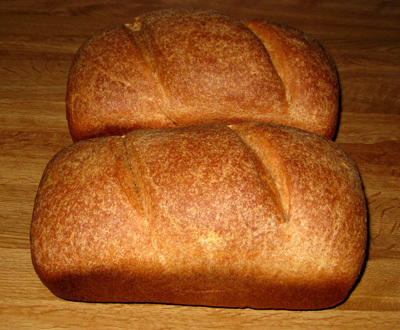 The basic bread recipe is great – I had success on my first venture. I’ve been wrestling with sourdough more recently and the loaves still come out a bit heavy. Brown’s starter formula works very well, but I’ve been using more unbleached white flour, and also using bread pans rather than baking sheets (to avoid burning the bottom. It’s a bit elusive but interesting. Have fun!